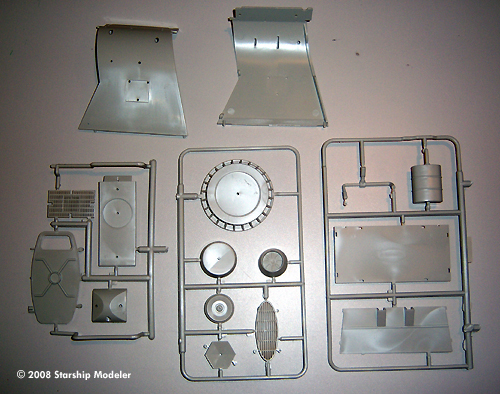 Parts: 105 + in grey and clear styrene . Accuracy: Looks pretty good to me, at least on the outside. The 'Space Pod' was introduced in the third (and final) season of Lost in Space as a means of separating crew members from the main cast so they could go adventuring. Apparently modeled after the contemporary Lunar Excursion Module of the Apollo program, it was one of the more believable pieces of technology on the show. Moebius' 1/24 scale model is the first-ever plastic model of this subject, released only forty years after it appeared on screen. 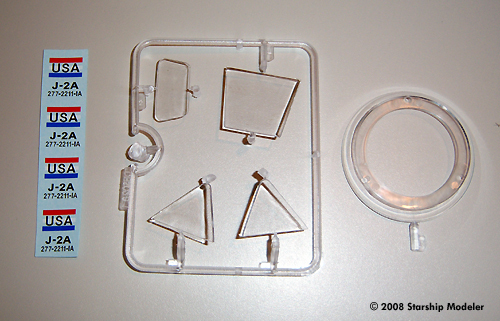 Inside the box are four bags of plastic parts comprised of 9 sprue trees of grey parts, one of clear, and several large pieces not attached to runners. 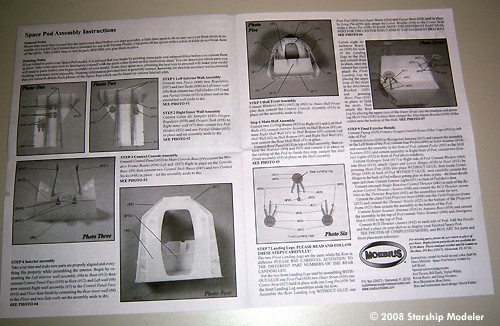 Instructions, a small sheet of decals, and an ad for Amazing Figure Modeller round out the package. The plastic parts - of which there are over 105 - are crisply molded with no flash, no warping and very little in the way of mold seams. Ejector pin marks are present on most of the larger surfaces, primarily on the interior of the pod. The model is broken down into a relatively few large pieces (including transparencies) that make up the shell of the vehicle; most of the parts count is on interior and exterior details (instruments, landing gear, controls, etc). The clear parts are very clear and distortion-free. Taping the major exterior parts together indicates that assembly should be relatively troble-free. The fit of these parts appears to be quite good. The rear hatch can be made removable in order to show off the work done inside. Silk-screened, waterslide decals are provided to mark the pod as seen on screen. Markings consist solely of the USA banner and vehicle serial number. The markings have good color density and are perfectly registered. If there's a downfall to this kit, it's the instructions. These are provided on four letter-sized, black-and-white pages and comprise a history of the subject (detailing the various models used in the show), two pages of assembly guide and a full-page paint chart. The history portion, with some interesting information, is the best part. The assembly guide consists of seven black-and-white photos and a lot of narrative text (in English only). The annotated photos are sufficient to show where things go, in conjunction with the text - just be sure that you make sure to read twice and glue once. The separate paint chart is neither comprehensive nor overly helpful. For instance, "Flat Black" is denoted as "color code L", but that "L" is not referenced in any of the photos or text. Among other things, it is to be used on "Assorted hoses, knobs, switches and dials throughout the interior". Nowehere - unless I missed it - is the interior floor color mentioned. The instructions do urge you to "research details from photos … which can be found on various Internet sites". However, my own (admittedly cursory) look through Google didn't turn up anything useful. A few diagrams would have gone a long way towards helping the modeler make an accurate rendition. 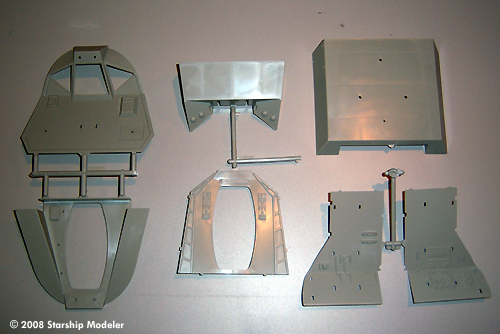 The kit is nicely molded and looks to be a straightforward build. The scale lends itself to dioramas - there are plenty of sources for 1/24 scale figures, and I don't doubt that the aftermarket will provide Space Family Robinson figures in the near future (especially with Mobeius' forthcoming Chariot in the same scale). The instructions … would have been state of the art in 1968; anyone who has built a few kits can puzzle their way through these. Those who are most concerned about "accuracy" will not be happy with the paint guide - but those I know personally would skip it in favor of spending weeks trolling obscure websites and hunting down ancient movie magazines anyway. I know the imprecise color callouts don't faze me - but I'll building this as an alternate-history moon lander. The MSRP of $37.99USD is a bit steep for what you get - but since very few places will be selling it for that amount, it's not a big deal either. Click here to read a review of Paragrafix' Photoetched Enhancements for this kit. Many thanks to my wallet for providing the review sample. Manufacturers and retailers, interested in getting your wares reviewed and publicized on a site averaging 6000+ readers a day? Contact us! 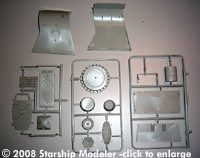 This page copyright © 2008 Starship Modeler. First posted on 31 July 2008. Last updated on 11 December 2008.